ABOVE : Peering through a spotting scope changes the way you see the world! THE FINEST SPOTTING SCOPE Y0U NEVER HEARD OF! This article is about optics, and not even optics that mount to a gun. It's about a spotting scope! Why on earth would I report on anything as mundane as a spotting scope? Pead on the see why the Meopta MeoPro 80 HD Spotting Scopre Review is one great read! When you try to see .22-caliber bullet holes on a black bull at 200 yards, your optics are strained. Not so with the scope we are reviewing! Well, for starters, how about the fact that over the past half-century I have owned a host of spotting scopes and found all of them lacking. Some were just marginal while others were like looking through a funhouse peephole. I know I'm not the only shooter with this problem, because every time I go to the range someone else shows up with a cheap rickety spotting scope that all but ruins his day. It seems like the only ones who don't have the problem are the competitive shooters. In the past I've paid what I thought was good money to buy inferior optics I've purchased scopes based on their specifications that never panned out. I have bought scopes based on the makers name and reputation, and that did't work, either I have been gifted several spoiling scopes that fell far short of the mark I even tried to acquire a surplus military scope, remembering pleasant experiences on rimfire target ranges. ABOVE : Americans know the stunning quality of the Zeiss binoculars made for the East German border guards. Meopta optics are on par with them! Their Di6 military binocular has similar features. On that one I backed off when I discovered it was way too underpowered for my needs. Fine for 50-foot ranges with rimfire rounds and 100 yards with .30 caliber bullets—not so fine at 200 yards and beyond. Over all this time I have perhaps had a dozen spotting scopes, none of which was satisfactory. What Does a Spotting Scope Do? A spotting scope is supposed to bring images in the field closer, making them easier to see. You may think it's OK to scan the countryside with the scope on your rifle, but if there are other people around you run the risk of pointing a loaded weapon at them—very precisely! But, hey. no sweat. You're cool with it. You'll keep your finger off the trigger, right? Meopta lenses meet the highest specifications. So high, in fact, that firms like Hassleblad and Leica use them! Photo provided by Meopta USA. Unfortunately that's the attitude some shooters take. However, in the course I took in the 1970s to get my German hunting license, I learned that a hunter never does that. During the two years I hunted in Germany there was only one "accident." It happened when a visiting French hunter shot at a rustling noise in the brush without identifying his quarry first. Binoculars are useful for some of this viewing, but most binos don't magnify the image sufficiently to see the kind of detail I need to see. A .22-caliber bullet hole at 200 yards is not that big and you're not going to see it through binoculars—at least not binos you can carry. A spotting scope is the only tool for the job. There's just one problem. Most spotting scopes being used by American shooters today aren't good enough to see .22 caliber bullet holes at 200 yards. Some can't even do it at 100! How many times have you seen guys with their el-cheapo spotting scopes, trying to see their target downrange, only to ask for a cease-fire so they can drive down and have a look. Until a few years ago. I was one of them. My last disappointment was a Celestron C70 Mini Mak spotting scope. Yes, I knew that Celestron sources that telescope from China; they make no attempt to hide the fact. But I reasoned that a prestigious name like Celestron, a company known for high-quality astronomic telescopes. would never sully their reputation with inferior products. When the Iron Curtin fell, a lot of talent went looking for work. Meopta had t h e reputation to make lenses and optical packages for the top houses. Photo provided by Meopta USA. Well, guess again! Apparently their marketing department is full of 30-something hotshots who know how to trade the corporate reputation and inertia for profits today. Its a short game every time, but the people playing it float their resumes before the ship hits the sand! And the "executives" watching over them played the same game when they were younger, so quality goes to hell in a picnic basket. One day on the 50-yard range I happened by chance to use a friend's Burris 15-45x60 spotting scope, because once more my Celestron was letting me down. The inexpensive Burris shouldn't have been a good scope, but every once in awhile an exceptional one escapes the factory. Lo and behold, this is one of them! I could see my target clearly for the first time! My friend had recently acquired this scope in a trade, and I made certain he didn't leave the range with it. When I calculated what I traded for it, it came about double what this sub-$200 scope was selling for online. But this particular one was special. It worked. I had looked through it and pronounced it clear and sharp! I had finally arrived at that point in life where what works is worth whatever it costs. You old silverbacks know what I'm talking about. I have used that scope for several years. Like an accurate gun, I've learned to never get rid of clear optics. Enter Meopta. I visited the Meopta booth at the 2016 SHOT Show to meet someone I work with in another capacity. No, I had never heard of them before then. Did I miss a memo? While in their booth I looked through a pair of their MeoStar binoculars and was pleasantly surprised— shocked, really. It's difficult inside a convention hall to assess the true performance of optics, but you can get a sense of the quality. When you can see flies walking on a ceiling girder 50 yards away, that's an indicator that the glass you're looking through is clear and sharp. I could tell, just by looking at the optical packages, and feeling their weight, that these were quality products. So, when I got a press release several months after the show, announcing the Outdoor Life magazine editor's choice award for the Meopta 80 HD spotting scope, it was something I had to test. The remainder of this report will concentrate on that scope, but first let's find out about Meopta. 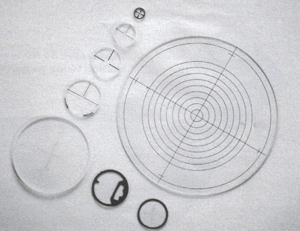 ABOVE RIGHT : Meopta uses its high-dollar precision optical manufacturing machinery to make sporting optics, as the schedule permits. Photo provided by Meopta USA. I interviewed Reinhard Seipp, the general manager and chief operations officer for Meopta USA. He gave me a thumbnail overview of the company. Meopta was founded in Czechoslovakia in 1933 as a maker of darkroom equipment—enlargers, contact printers and the like. You'll find their early products listed on eBay. Several of my blog readers are professional photographers who worked during the film era, and they know Meopta enlargers and print equipment very well. They have nothing but praise for everything the company made. ABOVE LEFT : The equatorial scope mount ring allows rotation of the main tube to position the 45-degree eyepiece anywhere the shooter desires. This one feature makes this scope very convenient to position. ABOVE RIGHT : I tried the scope on a camera stand clamped to the shooting bench, but it was too flexible. Vibration killed the view! You will also occasionally find Meopta military binoculars from the eastern block nations for sale online. I have never looked through any of these because they aren't common in this country, but if they are anything like the Zeiss NVA binos made for the East German border guards, they are nearly as fine as the top-branded binoculars on the market today! Meopta is large. With 2,500-plus employees and almost 1.5 million square feet of production space in New York and the Czech Republic they have a huge footprint in the optics world. How did such a monster come to be? 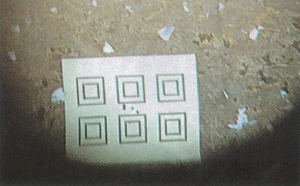 When World War II came, they expanded from purely photographic products into military optics. ABOVE : The MeoPro 80 HD is real value in a spotting scope. It rivals scopes costing twice as much! Photo provided by Meopta USA. At the end of the war the iron curtain went up and they found themselves on the communist side. They continued making military optics, and, because the communists had no free trade, they were under no pressure to control costs. The combination of meeting rigid military specifications and a lack of competition meant they were free to turn out the finest optics that could be made, so that's what they did. They made no sporting optics at this time. When the Berlin Wall collapsed in 1989, the company had over 6,000 employees—all suddenly unemployed! Following the fall of communism as a result of the Velvet Revolution, Czechoslovakia became the Czech Republic in 1993, and life became the same "anything for a buck" routine that West Germany endured right after the war. ABOVE : When you shoot a .221 Fireball at a target 200 yards away, you need a powerful spotting scope to see the holes. Even a good varmint riflescope isn't enough! American entrepreneurs started marketing the company's sterling optics capability and soon found willing buyers among the world's best-known houses—places like Leica and Hasselblad! 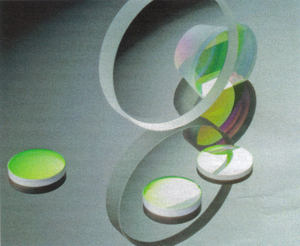 At first they sold lenses ground to specification, then optical subassemblies and packages. Finally they gained enough respect among their customer base that they were asked to make entire OEM products. If you are a user of ultra high-end optics you may already have used something made by Meopta without knowing it. Military a n d Industrial Applications Meopta continued to make optics for the military and also for industry. These are their two biggest divisions. For example, one of their industrial lines makes the high-speed optical scanners that check integrated circuits after manufacture. This work is extremely precise and requires the best optics—way beyond the level of products normally sold to sporting consumers. A lens-coating station can be purchased for around $60,000 today, but Meopta has several of them that cost $1.5 million each. The difference is seen in the precision of their finished lenses. But most of us will never use their military or industrial products. In 2007 the Meopta brand of sport optics was introduced to the American market. No wonder no one ever heard of them! Seriously, Meopta considers itself to be a boutique manufacturer of sport optics, and although they still manufacture high-end sporting OEM products for others, they don't compete with them. They rely on word-of-mouth rather than on advertising, and on the reports written by outdoor sports writers. The focus ring (dark portion) adjusts smoothly from 5 meters to infinity, and the control is there. The black knob (arrow) is the locking screw for the equatorial scope tube ring. 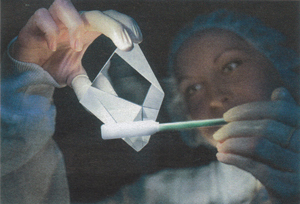 The tube can be rotated 360 degrees, making placement of the scope's eyepiece very convenient. They excel because they have all that high-dollar precision machinery that can be used for sport optics during the downtimes of industrial and military production. They don't care about sales volume in the sport optics line—it's not their major moneymaker. But when they pitch an industrial or military customer, it doesn't hurt to have a stunning, if recent, reputation for quality sporting optics. They will not compete on price in the marketplace, yet the lack of an advertising budget, coupled with the ability to use ultra-sophisticated optical manufacturing equipment, means they can offer a superior product for a relative bargain price. Their prices will seem high to the uninitiated (like me), but they actually cost only a fraction of what optics of similar quality sell for. The MeoPro 80 HD I am evaluating for you is particularly outstanding at a street price of $1,500. That's less than half of half of what an equivalent Swarovski spotting scope costs, yet this one offers the same quality. Let's test it! The first thing you notice is that this spotting scope is heavy. Compared to my 1 lb. 13.5 oz. bantamweight Burris Landmark that magnifies from 15X to 45X and has a 60mm objective lens, the 4 lb. 6.38 oz. Meopta is a light-heavyweight that magnifies from 20X to 60X. And I tested it right up to the limit—something I can only do with the Burris in bright sunlight. The objective lens on the MeoPro is 80 mm, and the weight of the package alone makes me believe the optics are better. They are certainly bigger! I thought if this scope can give a bright clear image at 60X it would be better than any spotting scope I have ever used. Sure, I've looked through the Zeiss scopes at IWA (the German equivalent of the SHOT Show) but you can't really tell much inside an exhibit hall. I want to see bullet holes at 200 yards. Meopta has two lines of sporting optics. The top line is called MeoStar and they have the finest of everything. They are priced at around two-thirds of what competitive brands with identical features sell for. The MeoStar spotting scope has interchangeable eye-pieces that allow owners to readily change the performance parameters of their scope. While that sounds like something you want, in fact most people never use the feature. They buy the scope and several eyepieces and then use just one eyepiece most of the time. And, this feature comes with a drawback. Besides the higher cost, each optical package has to be sealed to retain the nitrogen gas that's used to prevent fogging of the lenses. ABOVE LEFT : My shooting buddy had to look at through the MeoPro scope to see his 200-yard target his bullet holes. ABOVE RIGHT : The smart phone hangs down from the scope's eyepiece. It takes a sturdy tripod to steady this arrangement. If the eyepiece can be removed from the scope body, both the scope body and the eyepiece have to have a window on the side where they connect to seal the nitrogen inside. That window is just another piece of glass that does absolutely nothing for the performance of the scope. For the sportsman on a budget, there is the MeoPro line that is still high quality, but less expensive than the MeoStar. Sometimes, however, less can be more, which it is in this case. That is how the MeoPro 80 HD scope I'm testing garnered that Outdoor Life editor's choice award. With a North American transferable lifetime warranty, it's a bulletproof piece of kit. By having an integrated eyepiece, the MeoPro 80 HD has two fewer pieces of glass in the optical path, which means greater light transmission. So it's not just cheaer—it's also brighter. The eyepiece is quite large. The outer diameter is 57mm, much larger than most spotting scope eye pieces. The result is an image you don't have to search for. It's right there and easy to see at all times. On other scopes the exit pupil is so small that the image goes dark if you move your eye just a little, but with this one, you can relax. The scope mount base is mounted on a ring around the equator of the scope tube. This allows rotation of the scope tube to position the eyepiece anywhere you want for convenient viewing. A thumbscrew lets you lock the scope in whatever orientation you desire. That makes it so much easier to set up at the range. With the eyepiece set at a 45-degree angle, you can position the scope to allow convenient viewing. When Using A Spotting Scope, Get a Solid Tripod! Your tripod or mount needs to be strong and rigid. This is not the place for a $10 bargain tripod, because any shake will ruin the view. I used a professional Bogen model made to support a heavy medium-format camera of similar weight. The stability makes it possible to take pictures through the scope like a telephoto lens. A captive sunscreen is built into the tube and extends quietly from the objective end. You need it with that 80mm objective, because any sunlight that falls on the objective will dim your image! And both lens caps stay on positively—something the caps on none of my other spotting scopes ever did. The Centric Drive focus ring wraps around the scope tube. No matter what orientation the scope is in, the focus is always placed conveniently. The ring is turned several rotations for perfect focus. I was able to see images clearly at 60 power as close as 5 meters (16.4 feet)! Few shooters need performance like that, but I write about airguns, and for me the close stuff matters. At 60 power the depth of field is very short, so it's essential that the scope be solidly mounted. I stress the need for a solid tripod or mount. One last comment: the 80 HD does not have a fine focus adjustment like the more expensive scopes. This is another area for cost savings, but Meopta compensated for it by making the ring work for both fine and coarse adjustments. It turns slowly until the focus is razor-sharp at all distances inside the broad envelope. You don't need a separate fine-focus adjustment with this ring! To be perfectly honest, I'm out of my element testing this product. I'm a user—not a testing specialist. I know that the ability to resolve a lot of line pairs per millimeter is one test, but it's one I will never do. I'm Joe Sixpack. I know what I like, but I don't know all the tests that rank one optic over another. Like 10 percent of men I am red-green colorblind, so the degree of color-correction that I'm certain this scope has is lost on me. My right eye that I normally use for spotting has recently had the retina completely detached and surgically repaired, so it's not 100 percent, either. The doctor says I see 20/20 through that eye now, but the image it sees still doesn't line up with the left eyes image, and riflescope reticle' lines all appear bent. Enough temporizing! Lets look through the scope. This is what the target actually looks like. The hole on the left has three rounds through it. The other two were the first and second shot after cleaning the bore. The first image I saw through the MeoPro 80 HD at the range during setup was a ripened head of field grass, with something crawling up the right side. When I adjusted the focus, the "something" resolved into an inchworm on a head of grass about 60 yards away. This was on the lowest power. Low power is the best way to find an object. Then center it and zoom in as much as you want. In bright daylight the images were as clear on 60X as they were on 20X. But I could always see well at 100 yards with my Burris. 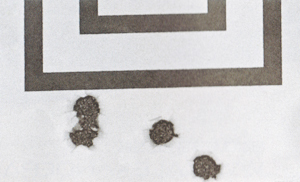 The real test came at 200 yards, looking at .22-caliber bullet holes in a black bullseye. I normally don't use a black bull at 200 yards because the holes are impossible to see even in direct sunlight. However, the MeoPro 80 HD changed that. The first time I looked out to 200 yards I could see three of four .22-caliber bullet holes in the black bull. It was the first time I've been able to do that, but three out of four is not perfect. However, a surprise was in store. The second time I had the scope out to the range, my shooting buddy asked if I could please look at his 200 - yard target. 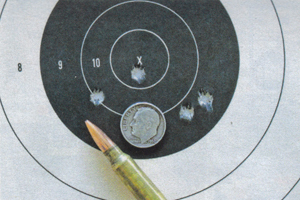 He could not see any holes from his .221 Fireball, or from his 7.62x39mm rifles. Both of these rifles are extremely accurate, so, unless his scope had come loose or failed in some way, they were probably there. I looked and saw them right away. There were three from the Fireball and three more from the 7.62. I described where they were inside the bull. Then he told me there should have been a fourth .221 hole and I responded that one of the holes looked larger than the others, but not as large as the three 7.62 holes. Wait a minute! I am now describing the difference in size between a two-into-one .22-caliber bullet hole and a .30-caliber bullet hole in a black bullseye 200 yards away with an eye that was blind just 45 days before! I would say that proves the MeoPro can do the work! After I did that, my friend came over to look for himself. 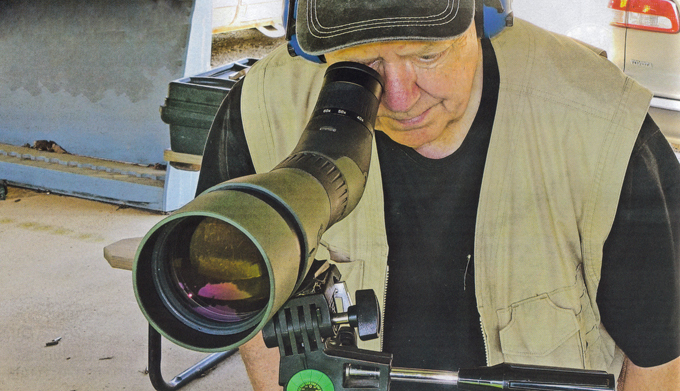 He has a vintage Redfield 20-60X spotting scope that has always trumped other scopes on the range. He bought it for a bargain at a local pawnshop, but this model is so well regarded that it often fetches over $600 online. Stunning is how I would describe the clarity and sharpness of the images I see through this spotting scope. It's like moving from an arms-room 1911 to one made by Wilson Combat. All the things you hope for when reading a report like this really do come true with this 80 HD spotting scope. Move over Steiner and Leica—there's a new kid in town and he has all your quality at a fraction of the price. 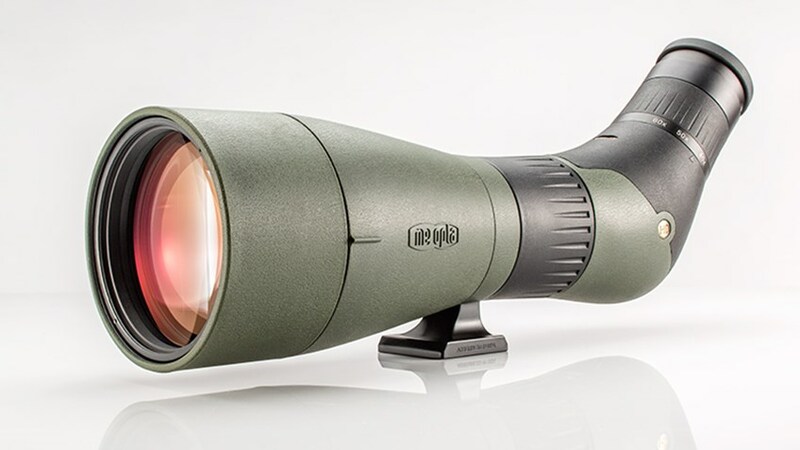 Looking to buy the best spotting scope at a discount price, the Meopta MeoPro 80 HD is for you. Meopta USA provided the eyepiece adaptor on the left, which had to-be epoxied to the back of a large smart phone case on the right. The glue residue is from the first failed attempt. Meopta also includes a mount for your smart phone that lets you attach it to the scope. You can watch the target on the screen of your phone instead of looking through the optics! This allows onlookers to see the target along with the shooter. Pictures of the target can also be taken this way. The spotting scope mount they include is for conventional phones — not the oversized iPhone 6 Plus I have, so I had to do some scrambling to make this feature work. Meopta sent me an adaptor that could be fitted to any size phone case, and I made good use of it. The first time I tried it I used JB Weld, which is a wonderful epoxy-based product. I didn't get the product to cover the mating surfaces completely, though, plus JB Weld is not specifically recommended for plastics. It held the weight of the phone until I bumped the edge of the phone with my shoulder getting up from the shooting bench. That broke the bond, dropping the phone to the ground. The second time I tried it I roughed up both surfaces to be bonded, then I made several dozen divots in each surface with a dental burr on a rotary tool. That gave additional surface for the epoxy to bond to, plus if the divots are made deep enough, it gives some mechanical "tooth" or grasp to the bond. This time I used an epoxy from Permatex that's specifically recommended for plastics, and this time the bond held tight for several outings. It's still holding strong as this is written. Does it work? Can you actually take photographs with a smart phone hooked up to the spotting scope this way? Yes and no. Yes, it is possible to take photos, but no, they aren't of the quality I need for my work. The smart phone software is automatic, taking control of the image and trying to make sense of it. That works well in some situations, but not in all. Let me show you. I guess smart phones are fine for selfies and filming brief TV ads, but when you need to control the camera, they fall short. The spotting scope, though, is a high quality optic that I plan to use for pictures. I will buy a rigid camera mount that can hold my camera steady. That way I can control the process and take full advantage of all that quality with a camera that has manual controls. I have seen what other photographers can do with similar setups and the quality is remarkable. I realize that what I did was not a complete test on this particular spotting scope. It's more of an evaluation of the MeoPro 80 HD. And, from the results I can say with confidence, "Yep, that'll do!" I wasn't trying to be scientific or even to be fair. I want to see tiny bullet holes a long way away, the MeoPro 80 HD spotting scope is the best way I've seen to do that. A spotting scope of this quality will probably not appeal to many shooters, because until you need one this good, you really don't care. I suspect professional hunters and guides already own equivalent scopes. Varmint hunters certainly have them—at least those who are serious. And, every benchrester alive has a good spotting scope as a part of their kit. Otherwise they are just pulling bullets. Years ago I learned that to be a good gun writer, I need good equipment. Even airgun writers put their equipment to the test all the time. Over the years I have upgraded my stable of equipment until I have nearly everything I need—until now. Yes, I paid this Meopta spotting scope the highest compliment a writer can give: I bought it. Each time I see the MeoPro 80 HD it's like seeing the most attractive woman at a party and envying the guy going home with her an instant before realizing she's mine! Where to Get One :: Right Here! Maybe this report resonated with you. If you have had my experience with bad spotting scopes and would like to upgrade to the best, you'll find Meopta sporting optics sold right here at Tactical Survivalist, online, discounted and direct to the public. I would like to thank Meopta USA for the opportunity to review this wonderful instrument, and specifically Reinhard Seipp for taking the time to explain both the Meopta history and also the technology behind the scope.